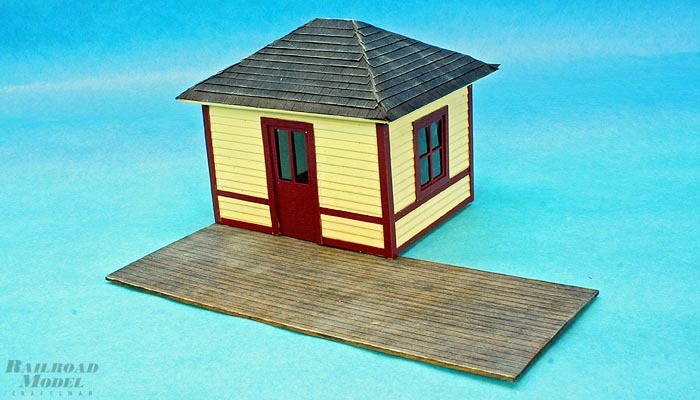 Available in both O scale as well as HO scale, the Quincy station model by Creative Laser Design will find a number of uses on any model railroad being able to serve as a flag stop station, crossing guard’s shanty or small yard office just to list a few the possibilities. 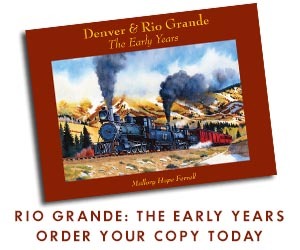 As the American railroad network expanded in the later half of the nineteenth century every small hamlet and crossroads near a railhead lobbied the various operating companies for a station of their own. Often the railroad management relented seeing the potential for expanded revenues and would build a station. 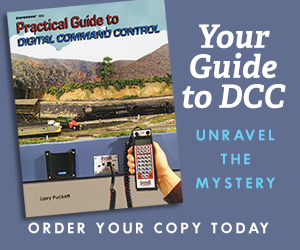 A railroad that was rapidly expanding or serving a newly founded settlement would often place a very small unmanned facility to serve the limited needs of the area and still maintain a corporate presence. Creative Laser Design’s Quincy Station is an example of one of these small “flag stop” stations that populated many a right of way during the nineteenth and the first half of the twentieth century. Based on a restored “Inwood” station on the privately owned Passumpsic Railroad museum where the structure serves as the railroad’s ticket office, the model effectively captures the general dimensions and out line of the prototype. 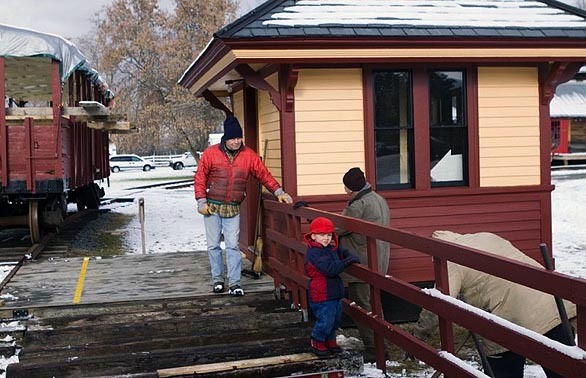 Vermont’s Passumpsic Railroad is a privately held collection that currently hosts the state’s only operating steam locomotive, a twenty two ton Heisler geared locomotive that was built in 1924 for a marble quarry, in addition to a collection of restored vintage rolling stock. For this review the O scale version of Quincy Station was assembled (The HO version of the station will be slightly different and has a printed shingle roof rather than the individual shingles used on the O scale kit). The review kit featured laser cut, milled basswood sheeting, thin plywood, card stock shingles and clear glazing in addition to various sizes of bass strip wood. All of the laser cut parts are cleanly rendered on quality stock. While a basic kit of a small prototype one should have some previous experience in constructing laser kits. The instruction sheet provides basic guidance to assemble the model; however, for some procedures that are not fully outlined a medium skill level will help. This will be evident when constructing and shingling the hip roof. This assembly will go together much easier if the builder sands angles between the roof sheets that are to be joined. This modeler did this by using patience, trial and error. The end results make for an attractive and unique structure. To match the Passumpsic Railroad’s attractive cream with dark red trim decoration all of the parts were pre-sealed, primed and painted before assembly using oil and lacquer based paints as recommended by the manufacturer. For those using water based paints, the parts should be pre-sealed with an oil based primer prior to applying color. The provided scribed station floor and platform was grained, stained and shaded before being attached to a separate scenic base. 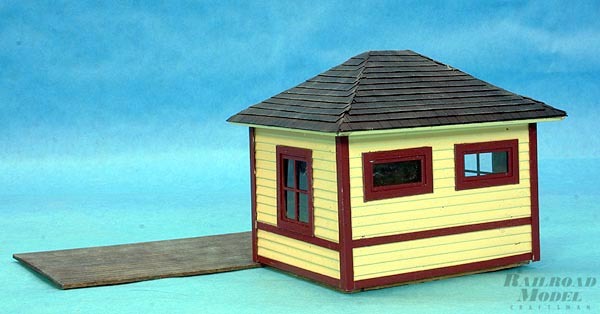 Available in both O scale as well as HO scale, the Quincy station model will find a number of uses on any model railroad being able to serve as a flag stop station, crossing guard’s shanty or small yard office just to list a few of the possibilities. By adding additional details, the modeler can create a truly eye catching model for a reasonable price.